Through Gospel for Asia native missionary Radru Kirti’s ministry, many Nepalis in India have come to know the Lord. Treated with disdain and rejection, Rudra Kirti grew up knowing nothing but life as a Dalit (“Untouchable”) in Nepal. His family followed the traditional religion of their country, but it offered no hope to Rudra. Choosing to follow no god at all, rather than one that left him empty, Rudra claimed to be an atheist. Little did he know that the God whose existence he denied would use his troubled past and Nepali background to minister to his countrymen in a foreign land. Seeing the void and desperation in Rudra’s life, one of his Christian friends invited him to church. Rudra attended a service and enjoyed it enough that he decided to go back to hear more. Soon, he was very involved in Bible studies and worship services, even becoming close friends with the church’s pastor. Through hearing God’s Word taught, Rudra began to sense the Lord working in his life. He began to understand the true love of Christ, and how it was so different from the hollow imitation his family’s traditions offered. As Jesus’ presence became more real each day, Radru decided to follow Him. Radru’s relationship with Christ progressed, and he felt a burning desire to serve the Lord full time. His pastor could sense God’s call on Radru’s life and recommended that he attend a Gospel for Asia Bible college. Trapped by a deepening addiction to alcohol and tobacco, Vasur’s health plummeted and his heart became extremely weak. After completing his studies, Radru began serving in the Delhi, India, area. He is reaching out to Nepali people, just like himself, who are living away from their native land. Many people have come to know the Lord through his ministry, and Radru now holds worship services in two neighboring villages. 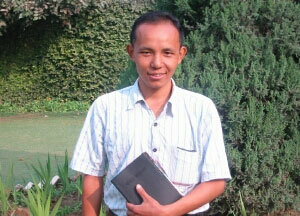 Vasur Tamang is one Nepali man whose life was dramatically transformed through Radru’s outreach. Although Vasur was a nominal Christian, he was not leading a victorious life. He had come to Delhi to find a good job, and in an effort to climb the ladder of success, he had given up even trying to lead a godly life. Trapped by a deepening addiction to alcohol and tobacco, Vasur’s health plummeted and his heart became extremely weak. Although he sought medical attention, nothing seemed to help. It looked like his life was over. Finally, someone told Vasur about Radru’s church. Remembering the power of Christ that he had deserted long ago, he attended one of the worship services. When Radru introduced himself, Vasur told him about his declining health. Stirred by the tragic story, Radru and the believers began praying for Vasur daily. And within two months, his condition was completely healed. Now, Vasur has turned back to the Lord and faithfully attends Radru’s church along with many others who have received the love of Jesus though his ministry. Once a cold, callous atheist, tattered by his life as a Dalit, today Radru joyfully proclaims the Gospel message to those who need the true Savior’s grace. Radru requests prayer that many more people will receive the gift of salvation through his outreach. He also asks for prayer that the believers in his church will continue to grow deeply in their faith. See how GFA is reaching out to another group in Delhi—youth. Learn more about Nepal, Radru’s home country.